William Lance Berkman (born February 10, 1976), nicknamed "Big Puma", is a former American professional baseball outfielder and first baseman. He played in Major League Baseball (MLB) for the Houston Astros, New York Yankees, St. Louis Cardinals and Texas Rangers. A standout baseball player at Canyon High School, Berkman attended Rice University, where he played college baseball for the Rice Owls. 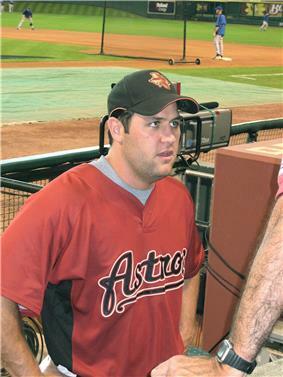 Named the 1997 National College Player of the Year, the Astros selected Berkman in the first round of the 1997 MLB Draft, and he debuted in MLB for the Astros in 1999. The Astros traded Berkman to the Yankees at the 2010 trade deadline. He spent the 2011 and 2012 seasons with the Cardinals, and the 2013 season with the Rangers, before deciding to retire. He signed a one day contract with Houston to officially retire as an Astro. Berkman is a six-time MLB All-Star. He won the National League Comeback Player of the Year Award in 2011. He stands 6 feet 1 inch (1.85 m), and weighs 220 pounds (100 kg). Berkman has spent various seasons of his career as a regular at all three outfield positions. Berkman was born in Waco, Texas, the son of Cynthia Ann (née Thomas) and Larry Gene Berkman. His paternal grandfather, whose family's surname was originally "Bjorkman", was of Swedish descent. Berkman graduated from Canyon High School in New Braunfels, Texas, in 1994. Berkman then attended Rice University playing on the Owls baseball team, where he was named the 1997 National College Player of the Year, playing for the legendary Wayne Graham, as well as named a first team All-America by Collegiate Baseball Magazine, Baseball America and The Sporting News. He was invited to visit the White House and dined with President Clinton along with the rest of the Baseball America honorees. Throughout college, he batted a collective .385 with 67 home runs and 272 RBI. His 41 home runs in 1997 ranked third-most in NCAA history. That year he also made the all-time record book in RBIs (2nd-134), slugging percentage (6th-1.031) and total bases (4th-263) while leading the Rice Owls to their first College World Series appearance. Berkman returned to Rice in 2014 to finish his degree. The Houston Astros of Major League Baseball (MLB) selected Berkman in the first round, with the 16th overall selection, of the 1997 MLB Draft. The team assigned him to play with the Kissimmee Cobras, their Class A-Advanced affiliate, of the Florida State League. In 53 games, he hit .293 with 12 home runs and 35 RBI. In 1998, his second minor league season, the Astros promoted Berkman to the Jackson Generals of the Class AA Southern League. His potential was beginning to show, as he hit .306 with 24 home runs and 89 RBI over 122 games. The Astros granted him a mid-season promotion to the New Orleans Zephyrs of the Class AAA Pacific Coast League. He played 17 games in New Orleans, and 1998 would prove to be his last full season in the minor leagues. In 1999, Berkman was midway through a great season in New Orleans when he was called up to the parent club, the Houston Astros. Prior to the promotion, he had been hitting .323 with 8 home runs and 49 RBI through 64 games. Throughout his entire high school, college, and minor league career, Berkman played first base. Because Jeff Bagwell was already entrenched at first, Berkman was shifted to the outfield to get into the starting lineup. His first stint with the Astros ended with 34 games played. He was demoted during the offseason for seasoning. The demotion proved brief, however; 31 games into the 2000 season, Houston again promoted Berkman. Moving from left field to right field, he hit .297, with 21 HR and 67 RBI. This firmly established him in the Astros lineup, and he became a starter for the rest of his career in Houston. In 2001, Berkman hit .331 (4th in the NL), posted a .430 On-base percentage (OBP) (5th in the NL), and drove in 126 runs (7th in the league). He also scored 110 runs and hit 34 home runs, while his 55 doubles led the league. 2001 also marked his first All-Star appearance (he would repeat in 2002, 2004, 2006, and 2008) and he was 5th in Most Valuable Player voting. 2002 saw his batting average drop to .292, although he kept his OBP high at .405. His power output increased also, resulting in 42 home runs. Berkman scored 106 runs and drove in 128, good enough to lead the league. He made his second All-Star appearance and was third in the NL in the Most Valuable Player voting. In 2003, Berkman's batting average dipped to .288, but his OBP remained high at .412. He hit 25 home runs, and drove in 93 runs, scoring 110. In the field, he played every game in left field, moving to center field once. Berkman also continued his reputation for being colorful and outspoken, advocating for the use of instant replay in games. In 2004, Berkman's average increased to .316, and his OBP was .450, having walked 127 times. He hit 30 home runs, drove in 106, and scored 104 runs. He also hit 40 doubles and appeared in 160 games, the most in his career for a single season. Berkman made the All-Star team, his third All-Star appearance, and placed second in the 2004 Home Run Derby behind Miguel Tejada. In May, his .785 slugging percentage and 24 RBI won him the National League Player of the Month for the first time in his career. Defensively, Berkman split 2004 between left and right field. Berkman signed a six-year, $85-million deal in March 2005. He moved to first base while Jeff Bagwell was injured. He ended the 2005 season with 24 home runs and 82 RBIs. In Game 4 of the 2005 National League Division Series against the Atlanta Braves, Berkman hit a grand slam in the 8th inning. That brought the score to 6–5 in favor of the Braves, but the game was tied in the next inning on a two-out solo home run by Brad Ausmus. The teams then battled for 9 more innings in what became the longest game in Major League Baseball playoff history, with the Astros eventually winning the game (and the series) in the bottom of the 18th inning on a Chris Burke home run. Burke had replaced Berkman as a pinch runner in the 10th. In the 2005 World Series, Berkman's first, the Astros were swept by the Chicago White Sox in four games, though Berkman compiled a .385 average with two doubles. His six RBIs during that series were the most of any of the Astros' hitters. On Mother's Day, May 14, 2006, Berkman was one of more than 50 hitters who brandished a pink bat to benefit the Breast Cancer Foundation. On September 13, 2006, Berkman became only the second switch hitter in Major League history to hit 40 or more homers in multiple seasons, with Mickey Mantle being the first. During the 2006 season, Berkman hit 45 home runs and had 136 RBIs, breaking the Astros single season record, which was set by Jeff Bagwell in 1997 (135). He also had a .315 batting average, an on-base percentage of .420, as well as a slugging percentage of .621. He also hit a career high 5 home runs from the right side of the plate. He finished third in the MVP voting behind Ryan Howard and Albert Pujols. Berkman started the 2007 season in a bit of a slump, batting .261, well below his career average, but rebounded for a strong second half of the season. Berkman finished the 2007 season with a .278 batting average, 34 home runs and 102 RBIs, along with 7 stolen bases. Berkman started the 2008 season batting well above .385 through April, won the NL Player of the Month in May and two separate Player of the Week awards, one which he went 29–32 (batted .906) with 6 home runs, including a McCovey Cove splash landing. At the All-Star break, he was in the NL's top four in batting average, with 22 home runs, and was on pace for 130+ RBIs. However, despite the rest of the team picking up steam behind the likes of Roy Oswalt, Wandy Rodriguez, Hunter Pence, and Ty Wigginton's rebound second half, Berkman's individual performance dipped significantly, and by season's end, he batted .312, with 29 home runs (7 of which were right-handed, setting a new career high), and 106 RBI. Berkman was fifth in the voting for the 2008 NL MVP award, behind Albert Pujols, Ryan Howard, Ryan Braun, and Manny Ramirez. Berkman hit his 300th home run against Arizona Diamondbacks starter Jon Garland on June 13, 2009. Berkman during his tenure with the New York Yankees. On July 31, 2010, Berkman was traded to the New York Yankees for minor leaguers Jimmy Paredes and Mark Melancon. He served as both a designated hitter and back-up first baseman during his tenure with New York. 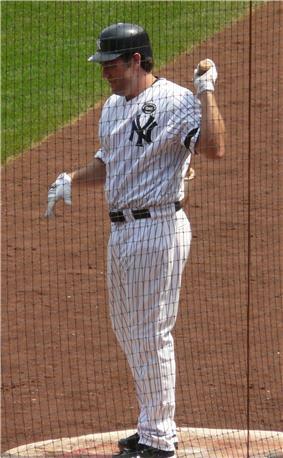 During the 2010 ALCS, Berkman served first base for the rest of the post-season when Mark Teixeira went on the disabled list due to a hamstring injury. The Yankees eventually lost the ALCS to the Texas Rangers in 6 games. The Yankees announced on October 27 that the club declined to exercise their option for Berkman for 2011. Berkman was under contract with the Cardinals for the 2011 and 2012 seasons. On July 5, 2011, Berkman hit his 350th career home run, and his long-ball was the second farthest home run ever hit in the new Busch Stadium. 2011 became a comeback year for Berkman, as he was one of the team leaders in batting average, home runs and RBIs. He was named the NL Comeback Player of the Year. Berkman made key contributions in Game 6 of the 2011 World Series vs the Texas Rangers. He hit his first home run in a World Series game in the first inning and in the ninth, with St. Louis down to their final strike before elimination, Berkman was driven home followed by Albert Pujols after a game-tying 2-run triple by David Freese. After Texas scored two runs in the top of the tenth and Ryan Theriot hit a run-scoring groundout, Berkman hit a two-out two-strike RBI single scoring Jon Jay to tie the game. Berkman won his first World Series championship as the Cardinals defeated the Texas Rangers in the series in 7 games. On April 22, 2012, Berkman was placed on the disabled list due to a calf injury. On May 21, 2012, Berkman was again placed on the disabled list due to right knee injury. An MRI revealed that there was significant cartilage damage to both sides of the knee and a torn meniscus, requiring arthroscopic surgery. Berkman returned on July 14, 2012. He was then placed on the 15-day disabled list on August 3, 2012 due to knee inflammation. It was the third time Berkman went on the DL in the 2012 season. On September 10, 2012, he was again put on the disabled list after having to go for a secondary meniscus surgery in the same knee. On October, 3rd, 2012, Berkman had his last at bat as a Cardinal. He spent the 2012 postseason on the physically unable to perform list as the Cardinals won the 2012 NLDS against the Washington Nationals but lost the 2012 NLCS against the San Francisco Giants. On January 5, 2013, Berkman agreed to a one-year contract with the Texas Rangers for approximately $10 million. On October 31, the Rangers declined his option, which made him a free agent. On January 29, 2014, he decided to retire. 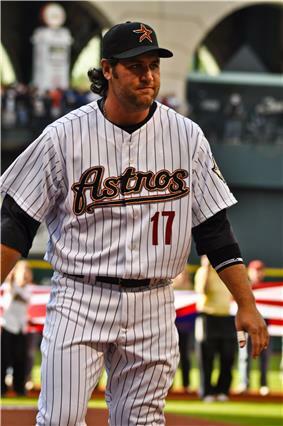 Berkman, along with former teammate Roy Oswalt signed a one day contract with Houston to officially retire as Astros on April 5, 2014. The Astros have not reissued Berkman's #17 since his trade in 2010. While it has not been formally retired, it is understood that no Astro will wear it again in the near future. 2011 World Series champion with St. Louis. Led NL in RBI (128) in 2002. Two-time National League Player of the Month (May 2004, and May 2008). Four-time National League Player of the Week for April 21–27 and May 5–11 in 2008; April 11–17 and April 25 – May 1 in 2011. National League record holder for most single season RBIs (136) as a switch hitter. National League record holder for most single season Home Runs (45) as a switch hitter (tied with Chipper Jones). Record holder for most home runs in day games at Minute Maid Park in Houston (147). Record holder for most career home runs at the Great American Ballpark in Cincinnati for an opposing player (23). Berkman and his wife, Cara, live in Houston with their four daughters. Berkman has been very outspoken about his Christian beliefs throughout his career. Berkman uses his position as a professional athlete to discuss his religious beliefs with others. He told The 700 Club in May 2007: "What you’re running after, what you’re trying to find will not provide you with any lasting fulfillment. The only place you can find that is Jesus Christ. It’s in the service of God you’ll find that lasting fulfillment." In 2001, Berkman began leading a charity called "Berkman's Bunch" where 50 underprivileged kids could meet Berkman before each Saturday home game for autographs and other gifts. In April 2012, Forbes named Berkman one of the 30 most generous celebrities as he and his wife had donated $2,412,245 to a foundation they established called To The Lord’s Fund. In July 2013, Berkman purchased a fire truck and had it overhauled by the City of Arlington. He then donated it to the City of West, Texas, in the wake of the West Fertilizer Company explosion that took place earlier in the year. The fire truck is white with a red Maltese cross on the doors and the name Berkman over the cross with his number "27" encircled within the cross. Berkman filmed an advertisement against Houston Equal Rights Ordinance, which seeks to protect LGBT individuals from discrimination. The ordinance is set to be voted upon as a ballot initiative in November 2015. He is most popularly known as "Fat Elvis" and "The Big Puma." Before the 2006 season started, in an interview with a local Houston sports radio station, Lance joked "I'm more like a puma so I'm not sure why people call me Fat Elvis." The show's hosts, John Granato and Lance Zierlein, ran with the moniker and Houston fans and media latched onto "The Big Puma." When questioned further, Berkman explained the nickname is simply logical. "Agile, athletic, sleek ... all the things that describe my game," he said, somewhat tongue-in-cheek. With his outstanding start in 2008, this nickname also became known on a national level. That same year, a Lance Berkman fan club calling themselves "The Little Pumas" emerged. During Berkman's long tenure with the Astros, they could be seen wearing puma costumes and foam puma paws at most Astros home games near the Conoco Pump in left-center field. The group became relatively well-known among Astros fans, as they were shown often during Astros broadcasts on Fox Sports Houston. Berkman was also one of the Astros' "Killer B's" in the mid-2000s, along with Jeff Bagwell, Carlos Beltran, Craig Biggio, and Derek Bell.